How is this possible? What does these score means for your pictures? Read the article for the answers to these questions. 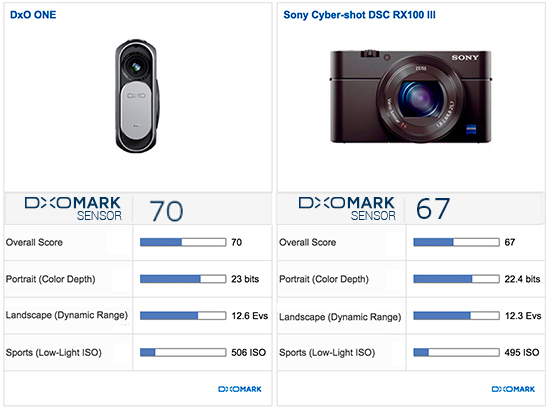 DxOMark is a part of DxO, but we have ranked the DxO ONE camera sensor using the same rigorous and objective test protocols as we have used with every other sensor from the hundreds of cameras we have reviewed since the very beginning of DxOMark seven years ago. As with any other camera, the DxOMark team has fully evaluated the ONE in objective laboratory tests and will be as transparent as possible regarding the science and implementation that enable DxO ONE to achieve a score of 85, one stop better than the best one-inch sensor so far. The DxO ONE outputs two different sets of RAW files, which is why there are two different DxOMark sensor results. The first “standard” RAW score of 70 is just above the extremely popular Sony Cyber-shot DSC RX100 III, which achieves a score of 67. The second DxOMark sensor score up to 85 is the result of what DxO refers to as SuperRAW Plus™, which is actually the result of four RAW frames captured in quick succession. DxO Connect software for Mac and PC utilizes Temporal Noise Reduction (TNR) to combine the four RAW files into one new SuperRAW Plus file that DxOMark analyzed. 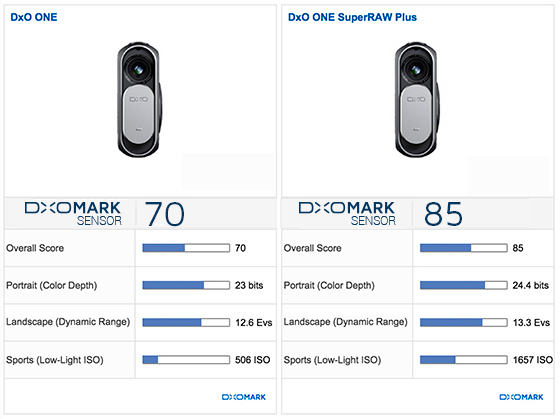 This article will explain in detail how the use of SuperRAW Plus impacts the DxOMark sensor score of the DxO ONE camera, and how it compares to other cameras, including those with far larger sensors. The DxO ONE camera is configured to capture images in the RAW+JPEG format in Standard mode. Standard RAW files are recorded as DNG files, which ensures maximum compatibility with popular photo applications such as Adobe Lightroom, DxO OpticsPro, and OS X Photos. In our tests, the default mode achieved a very respectable DxOMark sensor score of 70. This score is just above that of the very popular Sony RX100 III, purported to be the best one-inch sensor on the market today. The ONE iOS app also allows the photographer to utilize a special SuperRAW capture mode. Designed specifically for extreme low-light photography, the SuperRAW mode records four RAW images in quick succession and instantly combines them into a single new RAW file, the SuperRAW. Today this SuperRAW file can be read only by DxO photo software (Connect, OpticsPro, and FilmPack), each of which is able to further optimize and enhance the original RAW image. DxO Connect is also able to fuse the four RAW files into a 5th image in the same file, the SuperRAW Plus™. This SuperRAW Plus file was tested and analyzed using our standard DxOMark Sensor protocols, the very same protocols used to test all other camera sensors. Our tests conclude that the DxO ONE SuperRAW Plus file is able to achieve a score of up to 85, which puts it on par with many DSLR cameras, in third place in compact camera rankings, and 22nd place in the global DxOMark sensor ratings. As DxO ONE is also a connected camera, its score compares quite favorably against those of other mobile devices, such as the 38 MP Nokia Lumia 1020, which has a DxOMark overall Sensor score of 41. While the DxO ONE holds the third position for our compact camera rankings, it is a fraction of the weight and volume (less than 22%) of the two Sony Cyber-shot models, the Sony RX1 and RX1R, which currently hold the first and second place spots in the compact camera category. The DxOMark Score of 85 is quite remarkable, considering that both Sony models are equipped with full-frame sensors, much larger than the DxO ONE’s one-inch sensor. How does Temporal Noise Reduction work? The goal of low-light photography is to capture as many photons as possible, thereby producing an image with a high level of detail, but a low level of noise. The most common method of achieving this goal has been to increase the size of the sensor and aperture of the lens. This is precisely why DSLRs and prime lenses with good low-light performance tend to be fairly large in size. Another method involves the use of image science in the post-production workflow, and that is where TNR comes into play. Capture devices employing TNR are able to record several images at once, which are used as a representation of a single image. The multiple images are subsequently merged into one new image file with a resulting reduction in noise, and the process is typically completely transparent to the user. Some of the latest smartphones and cameras already use TNR. To our knowledge, this includes the Apple iPhone 6, which provides multi-shot noise reduction in low-light conditions; Sony’s latest camera models, which provide a multi-shot noise reduction option for JPEG; the Pentax K3, which captures multiple RAW images for use in creating HDR images; and the Red EPIC Dragon prototype that we tested last year. TNR involves averaging the pixels between the four consecutive frames. As noise produces a random pattern, the algorithm reduces the variance (the noise) in the new image by averaging the pixels. TNR works best when neither the capture device nor the subject move. When there is motion between the merged frames, it is necessary to detect and compensate for all motions between the frames so that pixels can be matched from one frame to another. If either the camera or the subject are in motion between captured frames, some parts of the image can be merged and other parts cannot. The percentage of pixels that are effectively merged in relation to the entire image is what is referred to as the “fusion rate.” The fusion rate varies depending on camera and/or subject motion conditions. If the camera is moving slightly between frames, the fusion rate can still be substantial thanks to the digital compensation of the camera motion — that is, most of the pixels can be averaged. However, if there is strong motion in the scene (as when the subject is running), the fusion will be partial. The fusion rate is further impacted by the lighting conditions in the image. Take for example an image in which the moving subject is primarily in the mid-tone range, but there are important details in the shadow areas, which are stationary. In this instance, the TNR will continue to be quite effective in removing noise from the shadow areas, even though the overall fusion rate is far from 100%. What does this mean in terms of SuperRAW Plus performance? Because the results of TNR can be impacted by motion between the frame burst and by the overall lighting conditions, the SuperRAW Plus score can vary wildly depending on the subject matter and the type of photography and shooting conditions. In the very best case, the subject is stationary and the fusion rate is close to 100%, resulting in a score of 85. This is typical of photos taken indoors, for example in a dimly lit restaurant where the subjects are sitting still. In the absolute worst case, where everything within the composition is moving in a random pattern between the frames, the fusion rate could drop to 0%, resulting in a score of 70. This type of image is in fact quite rare, but could for example involve a close-up of foliage with a very strong wind quickly moving every object and every associated pixel in the scene. It’s important to note that the SuperRAW file format is also designed to take advantage of future improvements in software (and thereby avoid obsolescence) by effectively removing any arbitrary cap on image quality. Most serious photographers have come to appreciate the progress made in RAW processing, which often tends to occur at a rate of change faster than that of capture devices. SuperRAW extends this even further by storing the original RAW images in both the spatial and temporal axis, and this opens for the RAW converters a brand new field in the quest for image quality. DxO’s new SuperRAW Plus file format is what enables the DxO ONE camera to generate an overall sensor score of up to 85. For more details behind the score, let’s examine how it performs under various conditions. As with other DxOMark evaluations, the Portrait score represents the sensor’s capability to provide vivid, varied and accurate colors under ideal lighting conditions. While studio photography typically comes to mind, it’s important to note that the portrait score is also relevant in outdoor photographs taken in bright and favorable lighting conditions. In this regard, the ONE proves it is capable of capturing portraits with a very wide gamut of colors. 24.4 bits is a great result for a camera this compact. In fact, the result is very similar to the some of the best DSLR results: the best APS-C sensor score is a very high 24.5 bits, achieved by the Nikon D7200. Thanks to its use of temporal noise reduction technology, the DxO ONE is able to provide better color and a greater color depth than cameras designed specifically for portrait photography. Landscape photographers often carefully compose their images and choose the optimal time to shoot. This type of photography commonly involves mounting the camera on a tripod and using the lowest possible ISO setting (the native ISO) to minimize noise, thus maximizing the image quality. Unless there is motion, relatively long shutter times are not an issue with a tripod. What is paramount is the dynamic range, especially since photographers often aim for detail in high-contrast settings, juxtaposing a bright sky with shadowy foliage, mountains, etc. Ideally, the dynamic range of the camera should be greater than the dynamic range of the scene, otherwise the details in the shadows will be lost or the highlights burned. Landscape photographers can effectively use the DxO ONE, as the DxO ONE iOS app enables them to precisely control ISO, aperture, shutter speed, and white balance. Here again, the results are astonishing. With DxO SuperRAW Plus files, landscape photographers can achieve a high dynamic range score that is the equivalent of Canon’s best full-frame DSLRs. The Low-Light ISO score (Sport) tells photographers how far they can raise the ISO setting while maintaining good image quality. Unlike the two previous scenarios, in which the native ISO can be used because either the light is generous (Portrait) or stability is assured (Landscape), photojournalists and action photographers often struggle with low available light and fast motion. Achieving a usable image is often difficult when pushing ISO. The low-light image quality threshold for all camera sensors is defined by three key DxOMark metrics, which are evaluated as the ISO setting is raised: Dynamic Range (9 EV), Color Sensitivity (18 bits) and Signal-to-Noise (30 dB). To be clear, the very same criteria is used for all cameras, which is the only way to ensure a relevant benchmark. The Low-Light ISO score refers to the highest ISO setting that meets all three criteria (i.e., DR >9EV, CS>18 bits, and SNR>30dB). Higher scores are better. In this test, DxO’s SuperRAW Plus file provided an extremely high score, better than all APS-C sensors in this category. As an example, the very highest APS-C Sport score to date was achieved by the Nikon D5500 (1438). Scores resulting from the SuperRAW Plus files are directly relevant for Portrait and Landscape because by their very nature, the camera and subjects are typically stationary, which is exactly the same as both of our test conditions that use the camera fixed on a tripod. As has always been the case, the Sports (Low-Light) score is also computed based on the camera being fixed to a tripod. So while the low-light aspects of the score are also directly relevant, the “sports” component requires further consideration when factoring in the new SuperRAW Plus format. While a score based on a fixed camera/subject may be very high, the actual camera performance is more often dependent on whether the photographed subject is moving during the time of the multiple exposures, which are required to produce the SuperRAW Plus image file. The performance results of the DxO ONE camera are quite impressive, in that a sensor score of up to 85 in such an incredibly compact camera clearly represents a breakthrough in design. The results demonstrate that the ONE can provide low-light performance similar to the best high-end micro-four-thirds or APS-C DSLRs. Coupled with the fact that the DxO ONE pairs seamlessly with the iPhone and iPad, the DxO ONE has redefined what a connected camera can be, and has demonstrated the level of image quality that can be achieved by such a system.